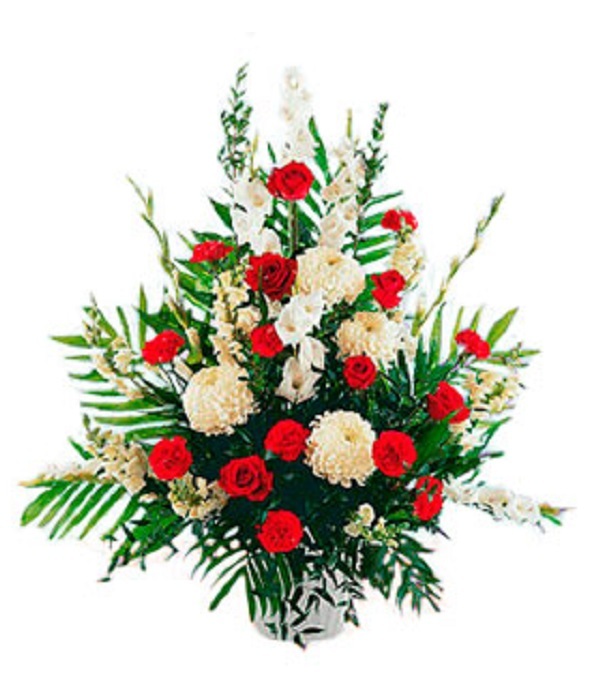 Commemorate the life and passing of a special someone with this classic nostalgic arrangement of celebrated flowers. Certain to capture the sentimental and emotional feelings of heartfelt happiness and remembrance, this centerpiece radiates the room with it's sparkling array of flowers and scents. This arrangement includes 3 large chrysanthemums, 4 snapdragons, 8 plump elegant red roses and 8 bolstering carnations compliment with fresh greens in an attractive basket with special floral foam to keep the flowers fresh. Measures approximately 48" H by 48â€ï¿½L.